I just wanted to share my most recent project. 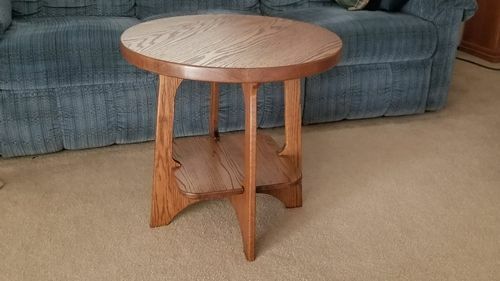 It is a small end table that I built from the plans I found in Wood magazine a few years back. The top is 6/4 Red Oak and the rest of the project is 3/4” Red Oak. The original plans called for quarter-sawn white oak but in my area the price was ridiculous so I went with Red Oak. The majority of our furniture is Red Oak so it matches just fine. This project caused me to stretch a little past my comfort zone. I built and successfully used my first circle cutting jig on the band saw. It worked great! I used my newly restored hand planes to flatten the top after glue up. That was really fun! I used a rattle-can instead of brushing on the finish. No drips or runs so I think that went well too. Chem, you did a nice job with this table. I have always liked that style. Two things for future reference: Quarter sawn red oak looks very similar to qswo once it is finished. Secondly, I used to cut circles with the band saw, but found that it is nicer with a router because there is much less sanding involved. That’s a fine looking Limbert table—congratulations! I’m sure you’ll get a lot of satisfaction from it! The plans called for using a router to cut the circle but I wanted to use the band saw jig. My local guy did not have enough 8/4 quarter-sawn red oak either so I just had to go with what was available. I put the Stanley No 4 to use flattening the top. It was really a joy to use. I don’t know how I ever got anything done without having hand planes. 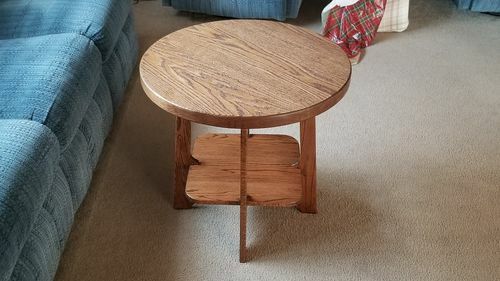 This little table was a Christmas present for my wife and she loves it. 6th on the looks nice! This is just me, but I wonder—since the grain is so strong—did you try different orientations between the top and the shelf? What you have is beautiful, but I would have found it interesting to turn the top vs the bottom to see if it made a difference. Like I said, it’s just me, and I’m not dissing anything. 6th on the looks nice! This is just me, but I wonder—since the grain is so strong—did you try different orientations between the top and the shelf? What you have is beautiful, but I would have found it interesting to turn the top vs the bottom to see if it made a difference. Like I said, it s just me, and I m not dissing anything. I went through several orientations before gluing up. What you see represents the best grain pattern available from the 8/4 board I had. Whats funny is that the grain pattern makes you think that you know where the glue line is but it’s an illusion. The glue line grain is almost identical on both sides of the joint. It kind of makes this table quirky and I like that. Had I had a larger budget I could have purchased more oak and maybe found a better match but that was no the case. 1/4 sawn would have been nice but my guy had very little on hand. Look to be well made so will be around for a long time to be used and admired. Id be interested to see the plans for the exact sizing.